Is the era of rockerless skis finally over? Dynastar's tip-rockered 2013-2014 Chrome 78 Pro replaces one of the very last holdouts, the thrilling Speed Course Ti. 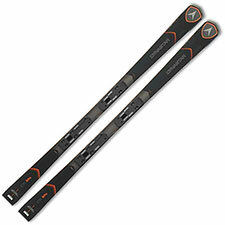 Debuting for the 2013-2014 season, the Chrome Pro is part of a new all on-trail ski series designed to offer expert and even elite-level carving performance by updating Dynastar's race-stock Speed-series skis with modern geometry. Yes, we've seen exactly this fusion before, in skis like Volkls RTM 84 and Rossignol's excellent Pursuit HP. Skis in this category tend to have a distinctive feel: easy to initiate, but also much more constrained in terms of turn shapes and amenable technique styles. The Chrome 78 Pro is certainly emblematic of exactly that quality. The ski rewards riders who let the plank itself do most of the work. Try to take the reigns yourself—and especially, try to impose turn shapes on the Chrome Pro by working the ski in the classic tip-to-tail manner—and you'll quickly find yourself on the losing end of the argument. The Chrome Pro is surprisingly stiff, torsionally rigid, and tenacious when it comes to edge grip. Turn radius is an expansive 19 meters. Beyond question, the ski likes to go fast. I found it slightly aft-biased, which was disconcerting, and absolutely committed to Super-G radius turns. The ski initiates easily, but demonstrates a dramatic lack of versatility. Subjectively, I just couldn't get comfortable with it. It reminded me in many ways of Dynastar's race stock Course WC, particularly stiffness. Like the Course WC, the Chrome Pro's stiffness and grip can quickly make you feel like you've stepped onto too much ski. Unlike the Course WC, and certainly unlike the Speed Course Ti, however, the Chrome Pro doesn't really seem to have a sweet spot. In fact, in my on-the-hill notes, I wrote that the ski's geometry seemed off. That could be an indicator that the bindings I was using were off center for my boot's shell length (I was riding at SIA's Winter Park On-Snow demo day, after all), or that the ski's tune was a little off. But my tilt is that this is not a successful replacement for the Course Ti. It feels more like the Volkl RTM to me: easy to turn, but not much fun to ski.